There are plenty of good anti-malware products, many of them free, but no one anti-malware tool is likely to identify and remove all of the millions of rogue malware that infest the cyber world. Since today’s malware generally writes itself into multiple parts of the operating system, and in many cases, can hide it’s files, registry entries, running process and services; making the infection virtually invisible. Regular readers of Tech Thoughts are familiar with this advice: “To ensure maximum safety, it’s important to have layered defenses in the ongoing fight against malware. As part of the mix of security solutions, online scanners offer an extra layer of protection that’s required in the current Internet environment”. 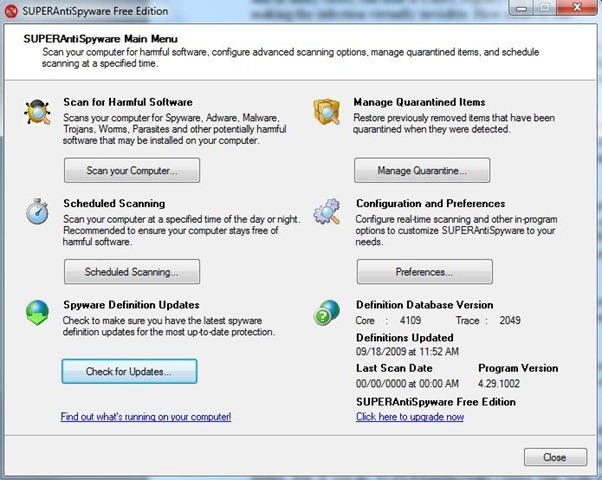 To make this layered defense approach a little easier, SUPERAntiSpyware has just released its free SUPERAntiSpyware Online Safe Scan, which the company describes as “a powerful new tool in the fight against the latest and particularly difficult malware infections”. 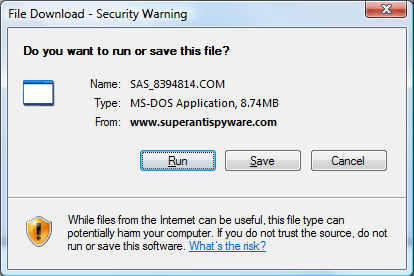 I’ve long been a big fan SUPERAntiSpyware, both the free version and the professional version, and now having tested this new offering on three systems, I can now add SUPERAntiSpyware Online Safe Scan, to my recommended list. This new online scanning service will detect, and remove, more than 1,000,000 malware threats, and in my early tests proved to be a speed demon. The average speed to spin through 42 GB was an impressive 17 minutes. Some of the most difficult to remove destructive malware circulation on the Internet at the moment include, Anti Virus Pro 2010, Windows Police Pro, Virut, Vundo, and Rustock. Trust me, you definitely don’t want to become infected by any one of these brutes. But, if you do, SUPERAntiSpyware Online Safe Scan will eradicate them. There is an interesting twist to this new product. Instead of downloading and installing the free edition of SUPERAntiSpyware, you simply download an executable which, when launched, effectively turns SUPERAntiSpyware into a cloud application. Pretty cool move. Correction: Earlier today I had mentioned that it was necessary to manually updated the definition database. My apologies for the confusion – the definition database updates automatically. Another very cool move. Thanks for that. I have made the correction. I’m impressed, if SAS will get rid of Vundo then it indeed is a good product. Normally that’s a automatic reformat, even for ubergeeks. Must be time for the trees to turn, hopefully the fall will be better than your summer. I track downloads on new applications like this, and in less than 24 hours this one has been downloaded 160+ times through Tech Thoughts. Looks like SuperAntiSpyware has a winner. This morning at 7 AM (I’m an early riser), the temp was a mind blowing 31 F – that’s bloody cold for this time of the year! I have a feeling the fall will be cooler than usual. Gonna have to watch the squirrels, etc. LOL! I haven’t run Win 98 in 8+ years and so I did not test this application on that system. I am curious. Once completed does the software leave any components on the tested system? Good question – but no components, other than the original downloaded executable, are left on the users system. First, NEVER download a security application when you are requested to do so by a pop up. This is the method that rogue software uses to spread. Second, I strongly recommend that you stay with only one download site for all your download needs, including downloading and testing anti-malware applications. Download.com is generally recognized as the safest download site on the Internet. Reviews and recommendations for virtually all software are available. Check it out. If you’re asking if you can run an online virus scanner while your principal onboard AV application is running, the answer is – yes. If the question is, can you install and run 2 anti-virus applications concurrently the answer is – not without the potential for conflict arising. Let me give you the same answer I gave a previous reader just today – well sort of. “*As a rule of thumb, it�s never really a good idea to run 2 anti-malware applications concurrently. At the very least, system resources take an inappropriate and wasteful hit. Beyond that, serious issues including system crashes, are common*”. It’s always a good idea of course to scan your machine with a second anti-virus application, say once a week or so, since there is no one application capable of identifying all the malware that is out there. So yes, go ahead and install another AV solution, and use it as a secondary on demand scanner. Just don’t run both programs both programs concurrently. That is, don’t allow both programs to start on Windows startup. Instead launch the “on demand” scanner from the program menu, or the desktop, when needed.